Dog Behavior Problems: Are You Reinforcing Bad Habits with Unearned Affection? This may come as a surprise to dog owners, but your dog’s behavior problems could be the result of your behavior. We know it’s hard to believe, but here at Come and Train It K9, we see it all too often. Dog owners shower their pets with unhealthy, unearned affection that elicits and reinforces undesirable behavior. Your dog responds by jumping on you, whining, barking, and maybe even peeing nervously because she senses your excitement and mimics your behavior in her own nonverbal dog language. You walk into your home at the end of the day, set your laptop bag on a chair, and calmly let your dog out of his crate. You don’t speak to him, you don’t pet him, and you don’t make eye contact. You simply open the door to your fenced backyard so he can go outside. When your dog returns to the door, he sits patiently until you let him in. You sort through today’s mail while your pup sits quietly and calmly at your feet. You pet him, expressing affection while he’s in this relaxed state. If the first scenario is your typical response, the second one probably seems aloof, cold and impersonal. However, the first experience, repeated daily, reinforces your dog’s bad behavior. Essentially, you’re teaching your dog being let out of the crate is the “best thing ever!” and each time he greets you, or anyone else, he should express his excitement by jumping and barking. Even worse, your pup may associate the crate with an undesirable place to be while he anxiously awaits your return. These distressed feelings can lead to a variety of other negative outcomes such as excessive chewing or separation anxiety. Your dog also learns jumping and barking with excitement every time a human comes through the front door will result in an abundance of affection. And while this may not bother you, how much do your guests enjoy this bad behavior? Change your own behavior so you can help your dog relearn good dog behavior. Quietly and calmly greeting your dog when you come home teaches her calm behavior earns human affection. Refusing to pet or engage with her when she jumps on you or barks sends the message that this behavior is unacceptable. Over time, your dog will learn you only reward good behavior; affection won’t be given just because he’s nudging you with his favorite toy or putting his paws on your lap to show you how cute he is. Showing your dog affection only when appropriate, so you can undo the bad behavior you’ve taught him, ultimately fosters a stronger human-canine relationship. This approach creates a happier, less anxious dog. And isn’t that exactly what you want for your pet? 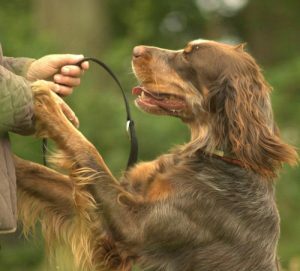 The Come and Train It K9 team can help teach both owners and dogs how to behave. Call us for a free consultation today!